The alternative to incineration isn't simply landfills, but a range of zero waste strategies. Please see our zero waste page for a wealth of information on these alternatives. Zero Waste is also a Climate Solution! Read the following reports for why incineration and landfill gas burning are NOT climate solutions, but zero waste strategies are! The corporate world knows that incinerators have a bad name. Even the most conventional trash incinerators will often dodge using that title, preferring "Energy-from-Waste," "Waste-to-Energy" or "Trash-to-Steam." In reality, these are really "Waste-OF-Energy" and "Trash-to-Toxic-Ash-and-Toxic-Air-Pollution" facilities. Read about how incinerators are NOT truly "waste-to-energy" facilities. See our Trash Incineration Factsheet and our Powerpoint presentation on incineration here, in Powerpoint format or Acrobat (PDF) format. Incineration is the most expensive and polluting way to make energy or to manage waste. It produces the fewest jobs compared to reuse, recycling and composting the same materials. It is the dirtiest way to manage waste - far more polluting than landfills. 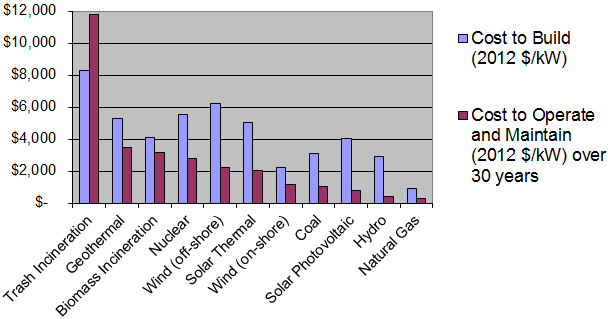 It is also the dirtiest way to produce energy - far more polluting than coal burning. The cleaner you make the air (with more pollution controls), the more toxic you make the ash (as the highly toxic fly ash caught in the controls is mixed with the bottom ash before landfilling). Incineration makes landfills more toxic by dumping highly concentrated toxic ash into the landfill instead of the less-toxic larger volume of unburned waste. Air emissions from incinerators far exceeds air pollution from landfills, and groundwater contamination from ash landfills is likely to be worse than from landfills full of unburned trash due to toxic metals being more available, and due to new pollutants having been created during combustion. 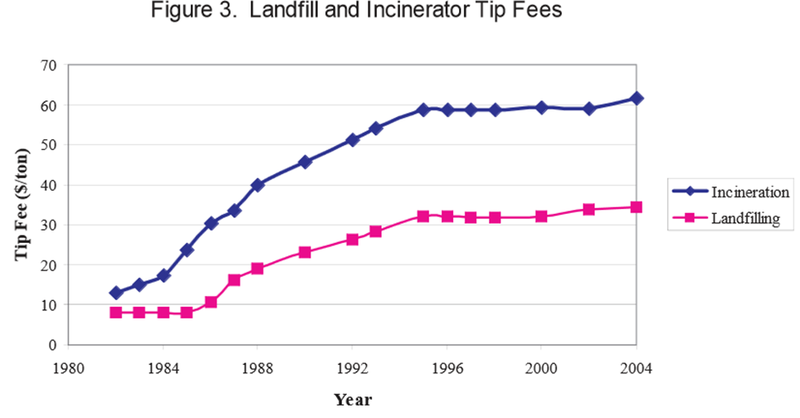 A 2017 life cycle analysis of incineration vs. landfills showed that, for Washington, DC, incinerating trash in Fairfax County, Virginia was worse by most measures than trucking the trash 2-4 times as far to southeastern Virginia landfills. On a majority of the 10 environmental measures evaluated, incineration turned out to be worse than landfilling, even counting the extra emissions from diesel trucks hauling waste further to reach landfills. In fact, emissions from trucking were insignificant compared to those from the waste facilities. Incineration proved to be worse than landfills when it comes to global warming pollution, and pollution from nitrogen oxides, particulate matter, toxic chemical releases, acid gases, and smog. On a 7th measure (eutrophication), they were about tied, and on three of the smallest measures of types of chemical releases, landfills proved to be worse. 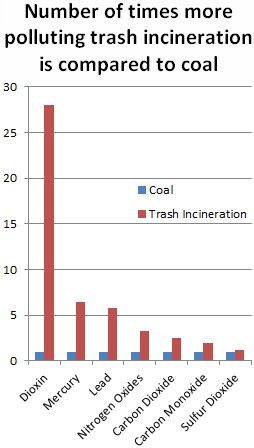 See our factsheet on how incinerators compares to landfills (and coal). To get direct to the summary data, see slides 26-59 in this presentation. Incineration by any name (including various staged incineration or "waste conversion" technologies, such as plasma arc, gasification or pyrolysis) is not clean or safe, despite industry claims. Even with the increased requirements for pollution controls that came into effect since 2000, incinerators are STILL dirtier than coal in terms of air emissions. Incinerators still turn trash into toxic ash and toxic air emissions. This reality is inescapable, as even with the most modern pollution controls, pollution levels still exceed coal by nearly all measures. According to the latest EPA data, trash incineration releases 2.5 times as much CO2 than coal per unit of energy produced. 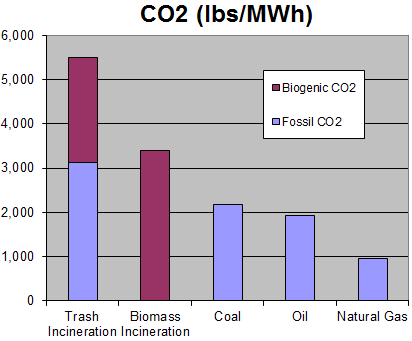 Even if you discount the "biogenic" fraction*, burning garbage is still 50% worse than coal for CO2 emissions. Continuing the use of existing trash incinerators or supporting the creation of new ones undermines any effort by a community to "green" itself and to reduce global warming emissions, if they're accounted for properly. The huge economic resources that need to be put into incineration are better spent on zero waste programs, which can reduce the amount of waste going to landfill by more than the 70% reduction in tonnage that incinerators accomplish -- and can do so at lower cost. Once a incinerator is built, "put-or-pay" contracts discourage recycling and composting by charging local governments the same, even if they produce less waste. No new commercial trash incinerator has been sited, built and operated at a new site in the U.S. since 1995. One large new one, however, was built in West Palm Beach, Florida in 2015, adjacent to an existing large incinerator. Some smaller ones have also been expanded or rebuilt. Despite hundreds of attempts to build new incinerators, community opposition has been the main force preventing them from being built. 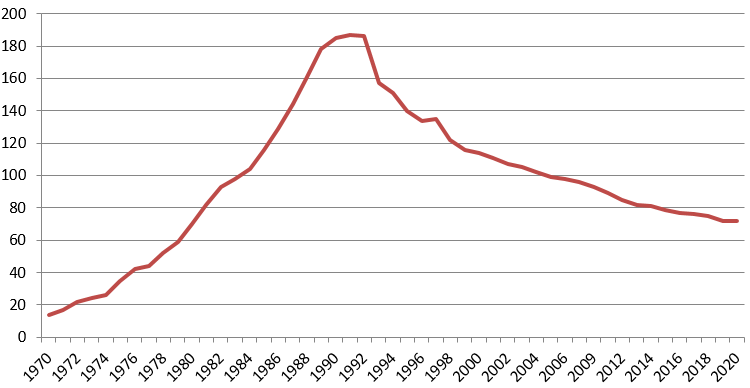 Overall, the number of operating incinerators in the U.S. has declined. In 1991, there were 187 trash incinerators in the U.S. At the turn of the century, there were 114. As of December 2018, there are just 75, the lowest number since 1981, and two more announced in 2018 that they plan to close. Number of Commercial Trash Incinerators Operating in the U.S.
One myth around the solid wastes produced by gasification is that they are a glass-like "slag" that never leaches. Of course, even conventional trash incinerators pretend that their highly toxic and leachable ash never leaches. With gasification systems, they still produce ash that can leach toxic chemicals into the groundwater where it is dumped. Unlike conventional incinerator ash (which mostly goes to landfills), gasification promoters often claim that they'll sell their "slag" as building material, soil amendment or aggregate. The ash is still full of toxic metals, halogens and radioactive elements that were present in the waste and which can't be destroyed. Data from coal gasification slag produced in a coal gasification facility in North Dakota shows serious groundwater contamination from leaching and is noted in this EPA report on groundwater "damage cases" from ash/slag disposal sites. See pages 82-83. In Feb. 2014, the state of Delaware determined that a pyrolysis proposal is incineration under the state's law that bans incineration from within 3 miles of a residence, church, school, park, or hospital -- which is basically the entire state. See background on ReNew Oil's proposed tire and plastics pyrolysis plant. More details on the state's decision are in their June 2013 letter stating that the pyrolysis process meets the state's definition of incineration. For many of these alternative types of incinerators and conversion processes (waste-to-fuels), see some of the basic arguments forth in our alternative fuels factsheet. The industry tries hard to pretend that plasma, gasification and pyrolysis are not forms of incineration. However, the European Union and the United States have defined all these technologies as forms of incineration (emphasis added). ‘incineration plant’ means any stationary or mobile technical unit and equipment dedicated to the thermal treatment of wastes with or without recovery of the combustion heat generated. This includes the incineration by oxidation of waste as well as other thermal treatment processes such as pyrolysis, gasification or plasma processes in so far as the substances resulting from the treatment are subsequently incinerated. ‘co-incineration plant’ means any stationary or mobile plant whose main purpose is the generation of energy or production of material products and: — which uses wastes as a regular or additional fuel; or — in which waste is thermally treated for the purpose of disposal. UK Environment Agency's website on waste incineration. Municipal waste combustor or MWC or MWC unit means any device that combusts, solid, liquid, or gasified MSW including, but not limited to, field-erected incinerators (with or without heat recovery), modular incinerators (starved air or excess air), boilers (i.e., steam generating units), furnaces (whether suspension-fired, grate-fired, mass-fired, or fluidized bed-fired) and gasification/combustion units. This does not include combustion units, engines, or other devices that combust landfill gases collected by landfill gas collection systems. Municipal waste combustor, MWC, or municipal waste combustor unit: (1) Means any setting or equipment that combusts solid, liquid, or gasified MSW including, but not limited to, field-erected incinerators (with or without heat recovery), modular incinerators (starved-air or excess-air), boilers (i.e., steam-generating units), furnaces (whether suspension-fired, grate-fired, mass-fired, air curtain incinerators, or fluidized bed-fired), and pyrolysis/combustion units. Municipal waste combustors do not include pyrolysis/combustion units located at plastics/ rubber recycling units (as specified in § 60.50a(k) of this section). Municipal waste combustors do not include internal combustion engines, gas turbines, or other combustion devices that combust landfill gases collected by landfill gas collection systems. the trade press, county waste facility managers, and the federal government's National Renewable Energy Laboratory. (2) Meets the definition of infrared incinerator or plasma arc incinerator. Infrared incinerator means any enclosed device that uses electric powered resistance heaters as a source of radiant heat followed by an afterburner using controlled flame combustion and which is not listed as an industrial furnace. Plasma arc incinerator means any enclosed device using a high intensity electrical discharge or arc as a source of heat followed by an afterburner using controlled flame combustion and which is not listed as an industrial furnace. (vi) Other factors, as appropriate. (12) Halogen acid furnaces (HAFs) for the production of acid from halogenated hazardous waste generated by chemical production facilities where the furnace is located on the site of a chemical production facility, the acid product has a halogen acid content of at least 3%, the acid product is used in a manufacturing process, and, except for hazardous waste burned as fuel, hazardous waste fed to the furnace has a minimum halogen content of 20% as-generated.